Combat has always been a big part of D&D, going back to the beginning of the game. In the fifth edition DMG it talks about how to tailor your game to your players, combat, puzzles, role playing etc. The system is really setup to be about killing monsters. Because you only get XP for that. I mean you can get for other things, but it's not like older games where you can get XP for treasure as well. On the weekend I played TOA (fifth edition), during our four hour session we were in combat for 3.5 hours. The same combat. There was four of us in the party against a herd of lizard like men riding mounts (6 baddies in total). The game went from DnD to basically a mini's game. All of the players were using the flanking rules, the added advantage if one of the other players was within five feet of you, etc. Now I've ran combat as a DM before, in fifth and in a LOT of old school games. We all know that old school combat for the most part is quick and deadly. As a DM I enjoy combat. As a fifth edition player, I do not. During this fight, it took so long for each turn to complete (did you know they did away with rounds?) that I went for a few smoke breaks in between my turn. When the fight started I thought to myself "All right I'll go out for a smoke when this is done". Forty five minutes later, I just got up after my turn and went outside. As far as the story goes, we didn't accomplish anything. 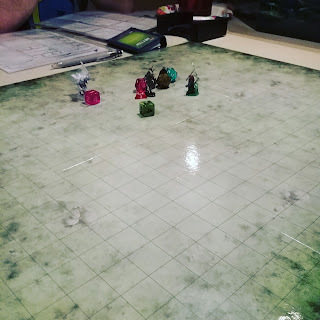 We walked away from some huts and a dead old lady that the party had killed. Made our way west, ran into some monsters that we evaded and then ran into the lizardmen dudes. The rest of the players LOVED the combat. Like love loved the combat. They were so into it. When the DM asked afterwards how he did, everyone praised the evening. When I got home, I was honestly a bit downhearted, and it's not fault of anyone. The few things running thru my head were. a) We were at fourth level and it took that long. I can't imagine what it will be like at higher levels, with feats etc. The "big bad" fight is going to take hours. (because there's always a big bad in wotc modules). b) I decided that my thief is just not the kind of character I want to play if we are going to be having fights like this. My back up character is basically meat with a greatsword. I mean if this is the new paradigm, than I might as well be swinging a big sword that does 2d6+4 right? c) I don't know if I honestly want to DM a game for this group. For a variety of reasons. Mostly my style. Obviously the mini's were needed to make the combat run smooth. I'm a big fan of theatre of the mind and tend to run most games like that. However in circumstances like this, I would have probably pulled out minis as well, just for the ease of figuring out who hit what, and who is attacking who. For the most part the whole situation comes down to DMing style, and how you run combat. I dunno if I could have made it faster if I was running it. I think it would have still dragged out a bit. There's obviously ways to get things to move a bit quicker. Group initiative for example. But whatever. 2. If you in the mood for a fight that's great, but sometimes it blows goats. 3. The game is built from the top down to have big fights. 4. There are far more complicated systems for war gaming than fifth edition, and if we are going to war game, well there's other options. From what I gather games like 3e, pathfinder etc were all combat heavy and took for friggin ever. 5. While there's a ton of information on the net to run 5e a bit more old school, it really depends on what your players want out of the game. It honestly didn't feel like my D&D. Yesterday was our fourth session. I played in the first session and missed sessions 2, and 3. Here's the catchup in case you are interested. The party made their way down the River Shoshenstar, along with their companions, Azaka, Xandala and Eshek. Making their way along the river, they encounter a few people who look like lobsters, who tell them to leave their area, to which the party high tails it out of there, and some hungry schools of fish, of which they are able to catch a few to eat. Continuing their way along the river, they come upon a deserted camp, with evidence of a major battle having taken place there, and a large statue with a crocodile on top of a man. The only living thing in sight is a large bird with a head that looks like a hatchet frantically running around a pen. Ren casts Speak with Animals on herself, and finds out that the bird got itself trapped in the pen. She also finds out that there are wood people around to the north. She opens the pen and lets the bird out, and it quickly takes off into the woods. Continuing to explore the camp, Ren investigates the latrines. Inside one of the latrines, they find a corpse that has been dead a few days. Tankard and Ren lower Dain down into the latrine by the ankles, and he ties a rope around the corpse's neck. They manage to pull the corpse out without decapitating him, and find a warhammer, ruined scale male armour, and a pouch containing a handful of gemstones. Tankard explores a burned down shrine, and finds a holy symbol in the shape of a Silver Gauntlet, which Ren identifies as being a symbol of Torm. The rest of the camp seemed to contain nothing of interest, so the party decides to explore the statue, which has a large tunnel between the man's feet. The tunnel is laden wit traps, which seem to be magically disarmed when one member of the party rides the other member of the party's shoulders. Travelling along the tunnel, bypassing all the traps by riding on each other's shoulders, they come to a ledge, which they go over leading to a tiled grid, another ledge, and a door at the end of it - the door having a similar pattern to the tiled grid on the floor - with certain tiles being lit up on the door. The party figures out that they need to step on the tile corresponding to the lit up tile on the door. Climbing up the second ledge, they quickly discover a glyph of warding on the door with a natural 20 on an investigation check. They figure out that how they need to press the button - riding on each other's shoulders, bottom person presses the first two buttons, top person presses the other two buttons. The door swings inward to reveal a room filled with dinosaur bones, and a spiral staircase with a jug at the pinnacle of the staircase. Continuing the trend of riding piggyback, Ren and Keldren ascend the staircase to retreive the jug. Ren identifies it as being an Alchemy Jug. Making their way out of the temple the same way they came in, the party finds themselves face to face with the wood people, a tribe of goblin like creatures wearing wooden masks. After a quick battle, the party dispatches the goblins, but not before one blows his horn. The party reaches their boats in time to see zombies and skeletons crashing out of the bushes. Making their way down the river again, the party sees a man on the riverbank - Artus Cimber, and Xandala's boat starts traveling towards him. The party shouts out to him, saying they've helped his daughter find him. Artus doesn't recognise Xandala. As she gets closer she starts casting a spell. His face kind of blanks over as her boat reaches him, she has a short conversation with him out of the party's earshot, he hands her something, and then she flys away. Once she is gone, Artus comes to, and discovers that he gave her the Ring of Winter - which he reveals is what's kept him looking ageless. He says the ring is very powerful, but won't go into detail what other power the ring has. Artus' travelling companion - Dragonbait - crashes out of the bushes shortly after. Artus and Dragonbait join the party, in the hopes of tracking Xandala down and regaining the ring. As the party further travels down the river, they come to another encampment, which has piles of dead human bodies around it, and beasts which have had the skin flayed from them, which is where we left off. The party made their way to Camp Vengeance. After a short exchange with the gate guards, they go to meet Captain Breakbone in the command tent. After learning they have arrived by boat, he demands they take sick soldiers and messages back down the river to Port Nyanzaru. The party refuses to comply, and Captain Breakbone tries to place the party under arrest. Dain takes offense to being arrested under false pretenses, and punches the captain in the nose. The guards in the room surround the party, and quickly surround the party and get some quick blows in. Tankard succesfully talks everybody down, and tells the captain that while they can't make their way back up the river, they can certainly heal the sick and cure disease, and Ren can send animal messengers to Port Nyanzaru to get all the messages out. It takes a few days to heal all of the sick people in camp - there are a lot of them - and while Tankard is healing them, he receives a mental message from Syndra Silvane, telling him that she's dying and reminds him that time is of the essence. While the party is getting ready to leave, a couple of dinosaurs that look like allosaurs and some large birds with beaks that bear a striking resemblance to a battleaxe attack the camp. While Ren and Tankard decide to fight from the wall for a few rounds, Dain decides to tackle the problem head on, so he decides to jump from the top of the palisade on to the head of the large dinosaur. He manages to make the leap, and effortlessly sticks the landing. Fighting from the ground and being the focus of all the dinosaurs rage, Dain goes down a couple of times, and is brought back up with healing spells from Ren and Tankard. Ren decisdes to help Dainf rom the ground - in bear form - while Tankard *tries* to assist with his crossbow from the palisade, with all of his bolts firing straight and true directly into the ground. As the birds join melee, the dinsours start picking them off as an easy meal, and the party manages to take down both dinsoaurs shortly after. From the outpost, the party decides to continue to M'bala on foot, leaving the boats at Camp Vengeance. After a few days march overland through the jungle, the party happens upon a large snail with a beautiful multicolored shell, up in the distance plodding along very slowly. Ren decides to go investiage the snail. As she gets close, a blinding flash of light emits from its shell, and it beings to wallop Ren with what seem to be tentacles. As the party joins the fray, As the snail takes damage, its tentacles seem to fall off, shrivel up and die. After its last tentacle falls off, it retreats into its shell, and emits a horrible wailing noise. The party quickly finishes off the snail, and nature is sad with Ren. The shell, while quite large and cumbersome - weighing about 250 pounds, appears to be of some value (about 2500 gp), so the party hauls it with them. Our heroes finally make their way to M'bala, a large plateau on a desolate, rocky plain. There is a path that winds its way up the side of the plateau, but it seems to be abandoned, littered with rocks, and overgrown. The party decides to make their way up the path, clearing it along the way, hauling the shell the whole way hoping to unload it in the settlement. At the top of the path, the gate is rusted to the point of obliteration, and there are piles of bleached human skulls are lying around. The party decides to hide the shell inside the gates. Once they make their way inside, they notice a small hut with a small figure plodding around. It notices them, and the figure turns out to be an ancient woman who appears to be blind. Ren cures her blindness out of a show of good faith. The woman recalls that the villagers used to call her Nanny Pupu, and that there is a nest of flying lizard people that ate the rest of the villagers. She asks that the party go dispatch the rest of the lizard folk. After exploring the plateau and finding nothing else of interest - the only real feature being a deep cistern filled with black scummy water - the party decides to tell the old woman they killed the lizard folk, without actually doing so. A botched deception roll later, Nanny Pupu attacks the party, calling forth a flesh golem from the ground to assist her. A very difficult battle later, with Tankard and Dain going down a few times, and a retreat not seeming to be an option - Nanny Pupu wants the party dead - the party emerges victorious. Our heroes will decide next session where they are going - are they going to continue west to Orolunga, or are they going to go in a different direction? After regrouping themselves after a pretty tough battle with Nanny Pupu, turning up a few gemstones and a spell scroll, our heroes decide to keep venturing West. First they meet a few muddy creatures that they don't understand. They keep walking, and the creatures don't seem to follow them. As they continue through the barren, desolate wasteland of a landscape, they notice 6 amphibious looking red creatures riding some birdlike/lizardlike things charging them. A very difficult battle ensues, with one of the newt-like humanoids chucking spells at them. Unfortunately, our heroes are overwhelmed by these creatures. Instead of killing them outright though, the heroes are knocked unconscious and taken prisoner. As the come to, all tied together on the back on one of the birdlike lizards (or is it lizardlike birds? ), Wren and Tankard overhear their captors talking about eating them. Wren quickly turns into a rat, and chews through everybody's bonds. Azalea tries to stealthily escape, but catches her cuff on the back of the creature they're being hauled on. Their captors take notice, and tie Azalea up again, and Wren chews through Azalea's bonds - again. Wren discovers that her alchemy jug is missing. Wren casts Pass Without a Trace, and the party slips away into the night. Wren recovers her alchemy jug, and the party manages to find a spell scroll, a potion, some nice armour, and a strange rod amongst the effects of their captors. The rest of the journey westward through the jungle is mostly uneventful, and the party eventually finds themselves in front of a crumbling ziggurat.